One of the Apocryphal or so-called deuterocanonic books of the Old Testament. It consists of two parts. The first (i. 1-iii. 8) is in the form of a prose letter with a historical introduction. 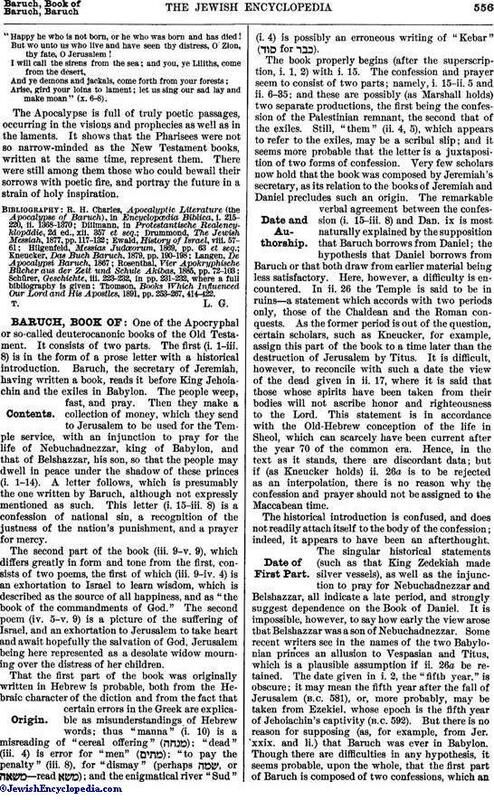 Baruch, the secretary of Jeremiah, having written a book, reads it before King Jehoiachin and the exiles in Babylon. The people weep, fast, and pray. Then they make a collection of money, which they send to Jerusalem to be used for the Temple service, with an injunction to pray for the life of Nebuchadnezzar, king of Babylon, and that of Belshazzar, his son, so that the people may dwell in peace under the shadow of these princes (i. 1-14). A letter follows, which is presumably the one written by Baruch, although not expressly mentioned as such. This letter (i. 15-iii. 8) is a confession of national sin, a recognition of the justness of the nation's punishment, and a prayer for mercy. The second part of the book (iii. 9-v. 9), which differs greatly in form and tone from the first, consists of two poems, the first of which (iii. 9-iv. 4) is an exhortation to Israel to learn wisdom, which is described as the source of all happiness, and as "the book of the commandments of God." The second poem (iv. 5-v. 9) is a picture of the suffering of Israel, and an exhortation to Jerusalem to take heart and await hopefully the salvation of God, Jerusalem being here represented as a desolate widow mourning over the distress of her children. The book properly begins (after the superscription, i. 1, 2) with i. 15. The confession and prayer seem to consist of two parts; namely, i. 15-ii. 5 and ii. 6-35; and these are possibly (as Marshall holds) two separate productions, the first being the confession of the Palestinian remnant, the second that of the exiles. Still, "them" (ii. 4, 5), which appears to refer to the exiles, may be a scribal slip; and it seems more probable that the letter is a juxtaposition of two forms of confession. Very few scholars now hold that the book was composed by Jeremiah's secretary, as its relation to the books of Jeremiah and Daniel precludes such an origin. The remarkable verbal agreement between the confession (i. 15-iii. 8) and Dan. ix is most naturally explained by the supposition that Baruch borrows from Daniel; the hypothesis that Daniel borrows from Baruch or that both draw from earlier material being less satisfactory. Here, however, a difficulty is encountered. In ii. 26 the Temple is said to be in ruins—a statement which accords with two periods only, those of the Chaldean and the Roman conquests. As the former period is out of the question, certain scholars, such as Kneucker, for example, assign this part of the book to a time later than the destruction of Jerusalem by Titus. It is difficult, however, to reconcile with such a date the view of the dead given in ii. 17, where it is said that those whose spirits have been taken from their bodies will not ascribe honor and righteousness to the Lord. This statement is in accordance with the Old-Hebrew conception of the life in Sheol, which can scarcely have been current after the year 70 of the common era. Hence, in the text as it stands, there are discordant data; but if (as Kneucker holds) ii. 26a is to be rejected as an interpolation, there is no reason why the confession and prayer should not be assigned to the Maccabean time. The historical introduction is confused, and does not readily attach itself to the body of the confession; indeed, it appears to have been an afterthought. The singular historical statements (such as that King Zedekiah made silver vessels), as well as the injunction to pray for Nebuchadnezzar and Belshazzar, all indicate a late period, and strongly suggest dependence on the Book of Daniel. It is impossible, however, to say how early the view arose that Belshazzar was a son of Nebuchadnezzar. Some recent writers see in the names of the two Babylonian princes an allusion to Vespasian and Titus, which is a plausible assumption if ii. 26a be retained. The date given in i. 2, the "fifth year," is obscure; it may mean the fifth year after the fall of Jerusalem (B.C. 581), or, more probably, may be taken from Ezekiel, whose epoch is the fifth year of Jehoiachin's captivity (B.C. 592). But there is no reason for supposing (as, for example, from Jer. xxix. and li.) that Baruch was ever in Babylon. Though there are difficulties in any hypothesis, it seems probable, upon the whole, that the first part of Baruch is composed of two confessions, which aneditor in the Maccabean time combined, prefixing the statement about Baruch. The obvious imitation of Job and Ecclus. (Sirach) in the second part of the book (see Job xxviii. ; Ecclus. (Sirach) xxiv.) makes it impossible to assign this piece to a time earlier than the second century B.C. ; and the conditions seem to accord with the early Maccabean period. Kneucker, Marshall, and several other recent critics, however, place its composition after the capture of Jerusalem by Titus, holding that the "strange nation" of iv. 3 ("give not thine honor . . . to a strange nation") refers to the Christians, and relates to a time when the antagonism between Judaism and Christianity had become pronounced. While this is possible, the expression may also be understood to allude to the antagonism between Judaism and Hellenism in the second century B.C. The verse iii. 37 ("afterward did he [or it] show himself [or itself] upon earth and converse with men"), which was much quoted by early Christian writers, interrupts the connection and is undoubtedly a Christian interpolation. The second poem (iv. 5-v. 9) belongs to the same general period as the first. It is divided into a number of strophes, each beginning with the words "Be of good cheer." The people, scattered and afflicted, are exhorted to trust in God; and Jerusalem, mourning over her children, is urged to take courage. The picture accords either with the late Maccabean period or with the time soon after the Roman capture of Jerusalem. The resemblance between iv. 36-v. 9 and Psalms of Solomon, xi. is striking. Whichever may have been the borrower, the two probably belong to the same period; and the Psalms of Solomon were composed not far from 48 B.C. The Book of Baruch was never accepted as canonical by the Palestinian Jews (Baba Batra 14b). According to the "Apostolical Constitutions," it was read in public worship on the tenth day of the month Gorpiaios (probably Ab). This statement, however, can hardly be considered authoritative; and even if it be correct, it can refer only to the usage of some group of Hellenistic Jews. If, as is probable, the first part of the book was written in Hebrew, its exclusion from the Palestinian canon must have been owing to its supposed lack of prophetic authority. It was, however, accepted by the Alexandrian Jews as a work of edification; and through the medium of the Septuagint it passed into the hands of the Christians, among whom it speedily became popular, being often quoted by Athenagoras, Clement of Alexandria, and many others as a work of Jeremiah and as sacred Scripture. In a number of early Christian canonical lists the work was included in Jeremiah, and together with the other Apocryphal books was pronounced canonical (deuterocanonical) by the Council of Trent (1545-63). Its canonicity, however, is not accepted by the Protestant churches. Besides its value as a mirror of the time, the book, though devoid of new ideas, contains many liturgical and poetical passages of great beauty and power. The Epistle of Jeremiah is usually printed as an appendix to the Book of Baruch and marked as ch. vi. of that book. It is, however, an independent work (see Jeremiah, Epistle of). the largest list of citations by early Christian writers is in Reusch, Erklärung des Buches Baruch, 1853. Introductions of Eichhorn, Welte, and others. For other works attributed to Baruch see Charles, Apocal. 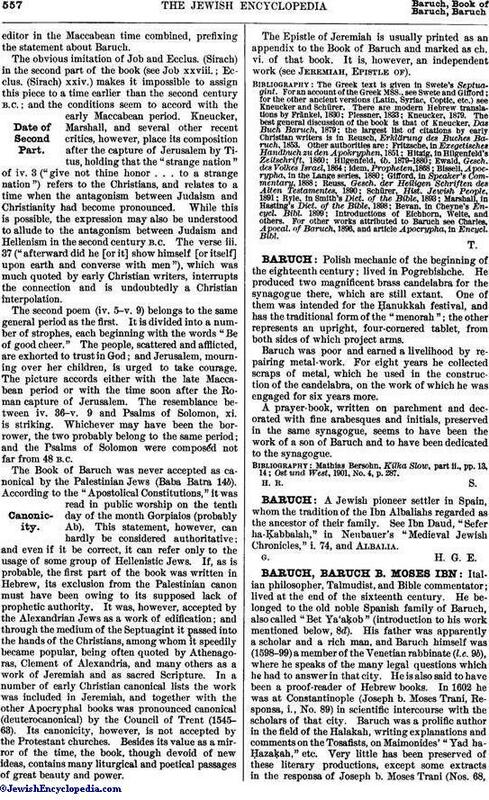 of Baruch, 1896, and article Apocrypha, in Encycl. Bibl.